Most parents of children with learning needs or other developmental differences – like stuttering! – have already heard about Individualized Education Plans, or IEPs. But many parents also have lots of questions about them. Who is eligible for an IEP? What are my rights as a parent? And is it even worth it to get an IEP for my child in the first place? There are federal requirements for public schools to provide all children with a “free and appropriate” education. If any child has a difference that would limit their ability to participate and learn in class, then the school is required to make a plan (if the parent agrees) to accommodate and support the child so they get the same quality of education as their peers. IEPs are one way that public schools meet these federal requirements. There are other options (such as a 504 Plan, covered in the next section), but you must have an IEP if you want your child to have additional services at school (such as speech therapy). Note: private schools may meet federal requirements in different ways, and may use different plans. 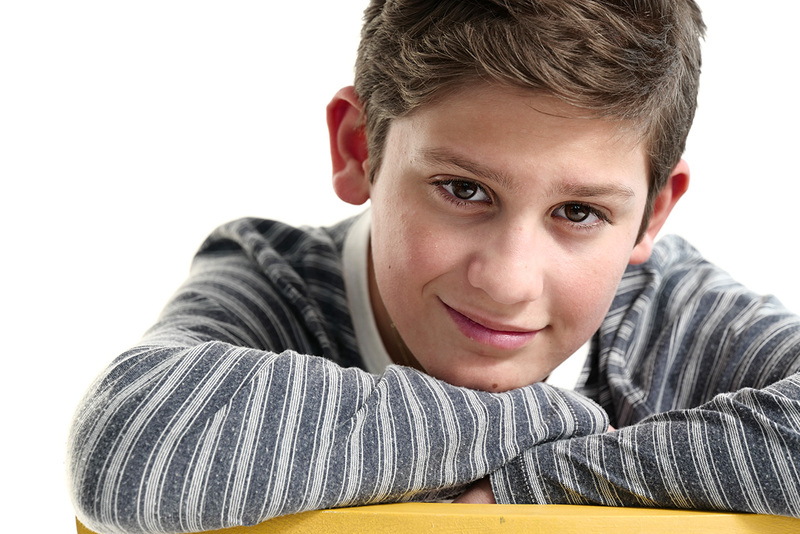 An IEP does not mean that there is anything “wrong” with your child. An IEP is just a legal document that defines the plan for any special education or support services that a child will receive in public schools. It lays out goals for the child to be working towards and also states what services the child will receive (and how often they will receive them). Children who stutter are often eligible for IEPs, especially if stuttering affects their participation in class or in social situations. But not all children who stutter need an IEP. There are many situations where IEPs are helpful documents for children who stutter and their parents. …it allows for support from a skilled speech therapist in the school system who is willing to advocate for the child and provide a safe space to talk. …the IEP team at the school values input from parents (and students too!) in creating a meaningful plan to support the child’s learning and development. …there is a need for other services or if there are other classroom concerns, such as special reading or learning needs, in addition to stuttering. …the child does not want or need speech therapy in school. …the child is relatively comfortable with their stuttering and participating in class and social situations. …the student already has a good relationship with a private speech therapist. …if they go to a private school (where IEPs may not be available), or are planning to go to a private school in the near future. As a parent, you have many rights related to your child’s IEP. You can (and should!) participate in all IEP meetings where decisions about your child’s plan are made. You also have the right to deny consent for services or to contest decisions that you do not agree with. And your child can be a part of the IEP meetings too! It can make a huge difference for kids to advocate for themselves and to have a voice in setting their own goals and accommodations. It is important to give teens, and many younger kids as well, the option to participate. A note: speech therapists working with children who stutter need to have some experience with stuttering and the emotional needs of children who stutter, or they need to be willing to collaborate with other stuttering specialists. This can be specified in an IEP and is important to advocate for when setting up services for your child. If an IEP is not the right fit for your child, but you still want to be sure that they are provided with accommodations and protections in class, do not fear! A 504 Plan may be a better option for you. In the next section, we’ll talk more about Section 504 and the kinds of accommodations that are helpful to request for children who stutter. 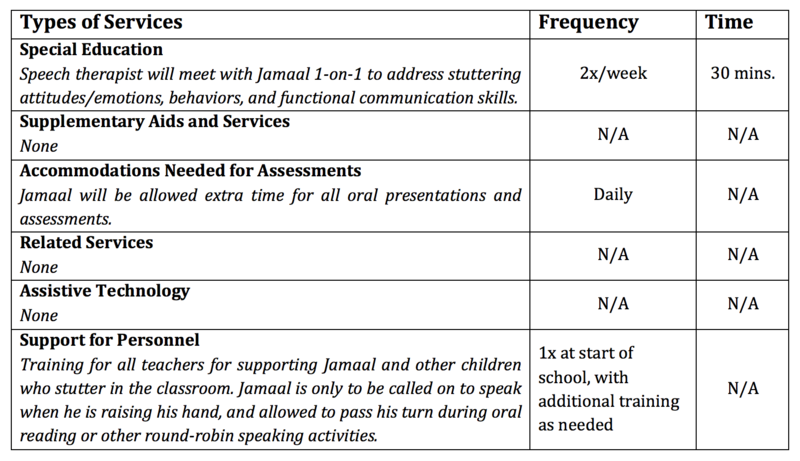 Annual goal: To increase overall classroom communication skills, Jamaal will raise his hand in class at least twice per week for four consecutive weeks.